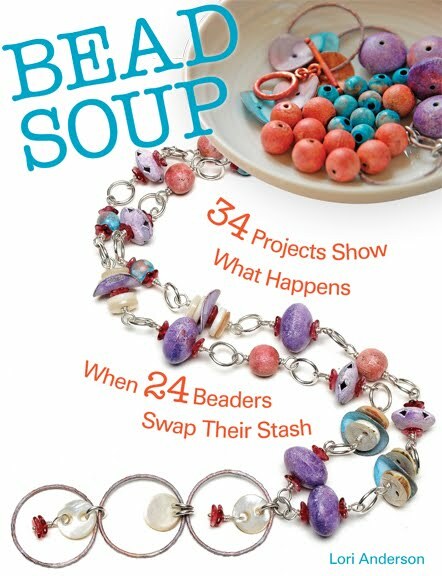 Pre-Orders for Bead Soup Book! Looking for the Cup of Bead Soup lottery? Click here! I'm happy to announce that pre-orders for the Bead Soup book are open! Just look to the right column of the blog to order. Priority Mail shipping to US residents. if $5.00 doesn't cover it (your choice of either First Class or Priority Mail). Books will be shipped as soon as I get them, between Sept/beginning of Oct.
and they don't include the free tutorials). when I'm told who will be in the books' Gallery! Thanks so much,and don't forget! 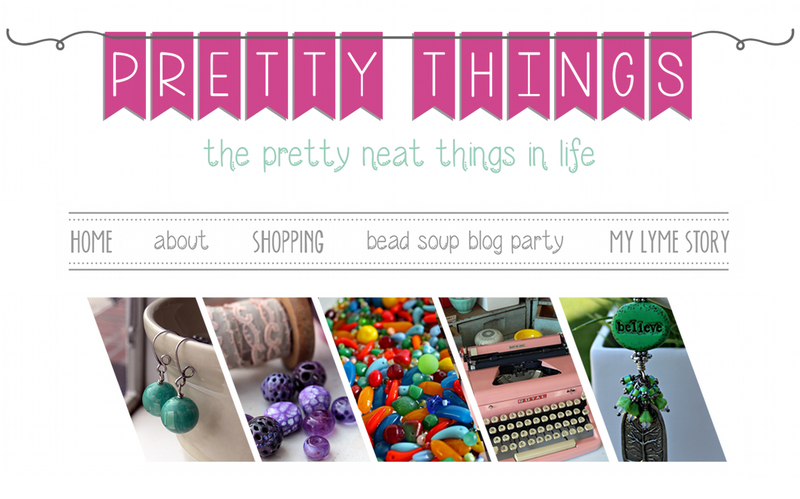 If you've been a follower of my blog, you're familiar with my Cup of Bead Soup project. For the past year, I've purchased beads, sight unseen, from various bead makers and tasked myself with creating things with components I didn't choose myself. It's been a fantastic way to push my design skills and break out of making the same old/same old. 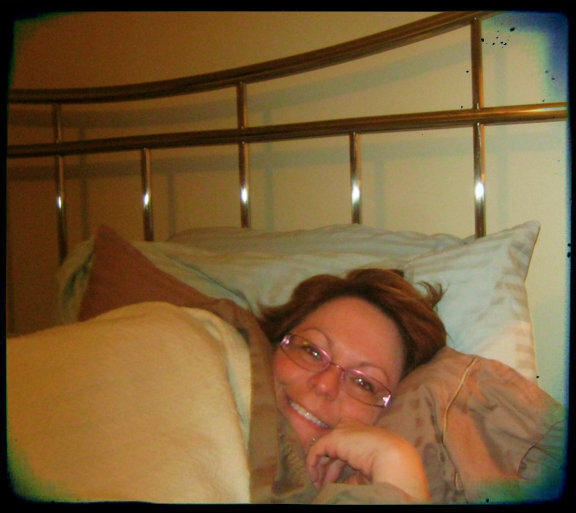 In essence, it's a one-woman-production of the Bead Soup Blog Party. But this year, I changed things up. 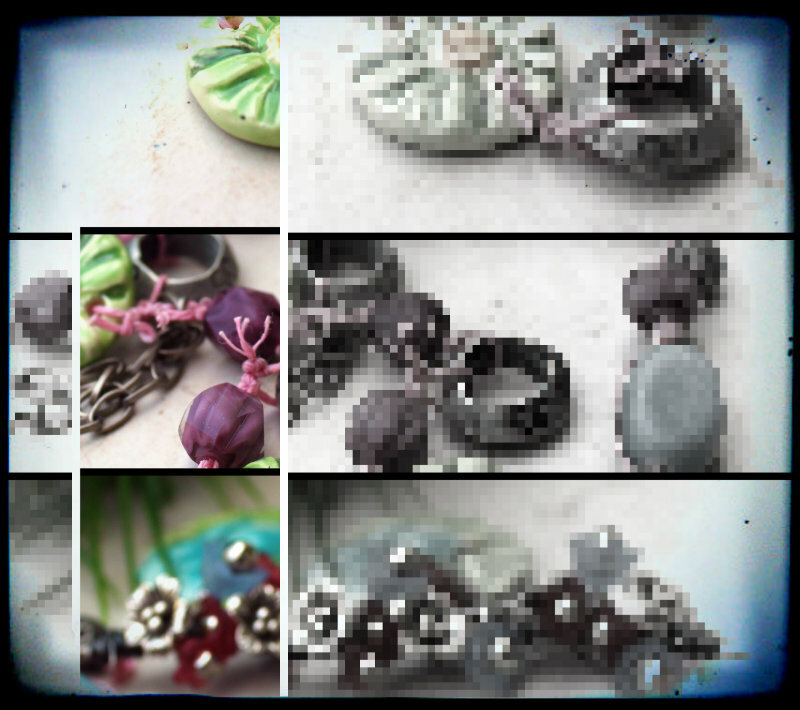 Now, three lucky people will be chosen at random, and these three designers will receive the same bead I do. 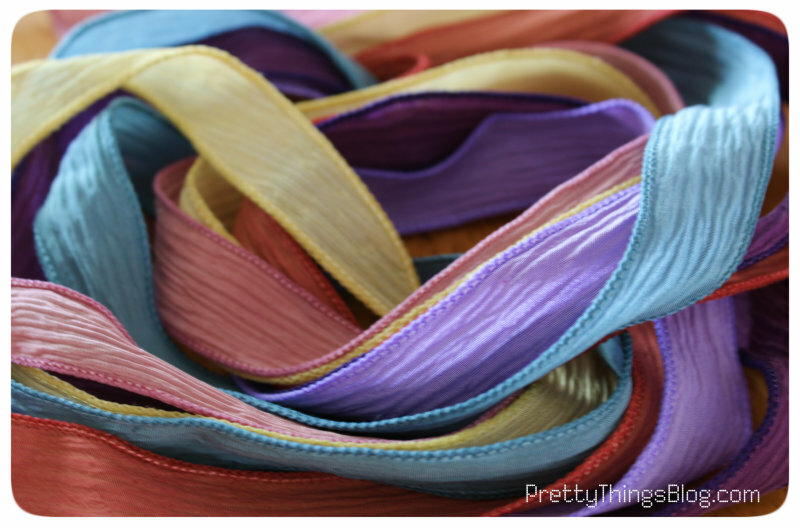 We'll make our pieces and have a mini-blog hop on June 30th. 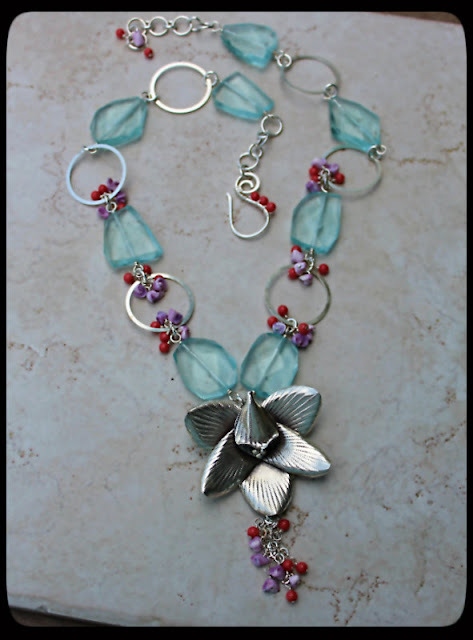 Lea Avroch is this month's Cup of Bead Soup contributor. 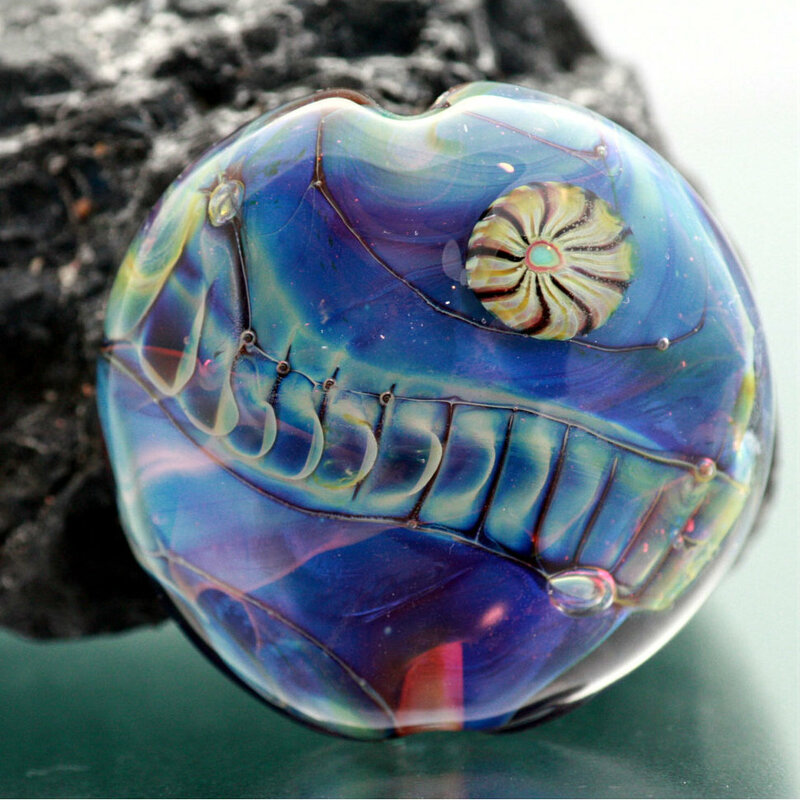 She's a fabulous lampwork artist and she's created a gorgeous focal bead for us. It's made with silver glass (expensive and touchy to use so I haven't gotten the nerve to use it yet!) with murrini and beautiful patterning. 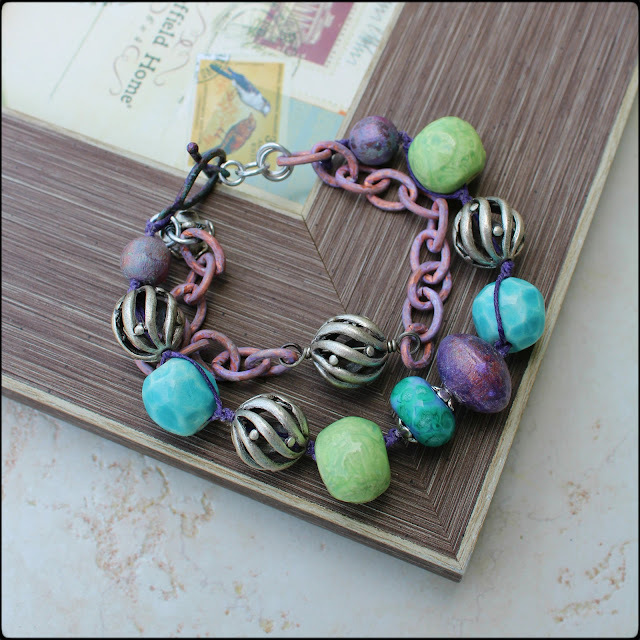 For this Cup of Bead Soup, you'll receive this focal -- and you use your EXISTING STASH to make something. As a veteran and the wife of a retired veteran, Memorial Day has special meaning to me. My Memorial Day post from last year pretty much sums up my feelings, and it also shows how I shared the meaning of Memorial Day to my son. A New Perspective -- or maybe just a nap. 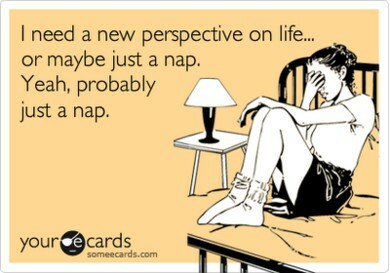 I dearly love the irreverence of someecards.com and sometimes they say things that are just spot on. While weaning myself off this last drug trial that didn't help me at all, I've dealt with worse insomnia than I normally do. And I don't want to use the sleeping pills I have because why add one more chemical when I'm trying to get OFF one? I have some of my best ideas while driving (I really need to invest in a voice recorder) and at night when I'm trying to sleep (and I've tried writing down notes but like that one Seinfeld episode -- the joke makes no sense when I wake up. One thing I do know -- I'm trying to figure out what to do next. I've been dawdling on writing the memoirs because some parts are painful, some parts are shocking (and I can't help but wonder, "what will they THINK? ", and parts need to be checked, Tom-Clancy-like, to make sure I'm not talking about something that *I* think is innocuous but which really is still under Top Secret clearance. The eBook went well (thank you thank you thank you -- and if you haven't been bored of my shilling it, it's in the right hand column of the blog) but it's not quite time for another blog prompts book (but there WILL be one). I like writing tutorials so writing beading books is awesome, yet there's all those anecdotes that pop up in the car and at 3am. In the meantime -- feel free to throw a topic at me and I'll see if it meshes with a thought that's been needing that kick in the pants to break free. Going to skip that nap today. With the Bead and Button Show coming in a couple of weeks, I've been making a lot of lists and am starting to check them twice. 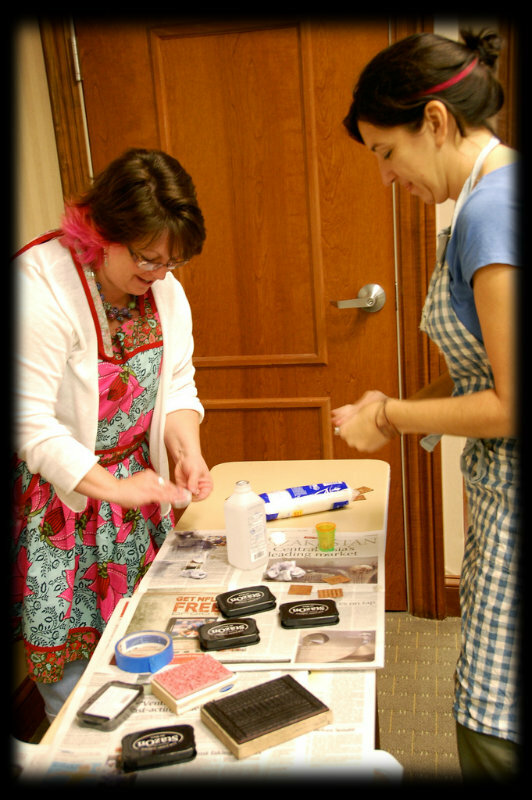 I thought I'd share some things with you today on how to prepare yourself for a big bead show. I'll never forget my first one -- I just stood in the door and hyperventilated for a bit before I spent way beyond my budget. I've since learned how to handle myself! 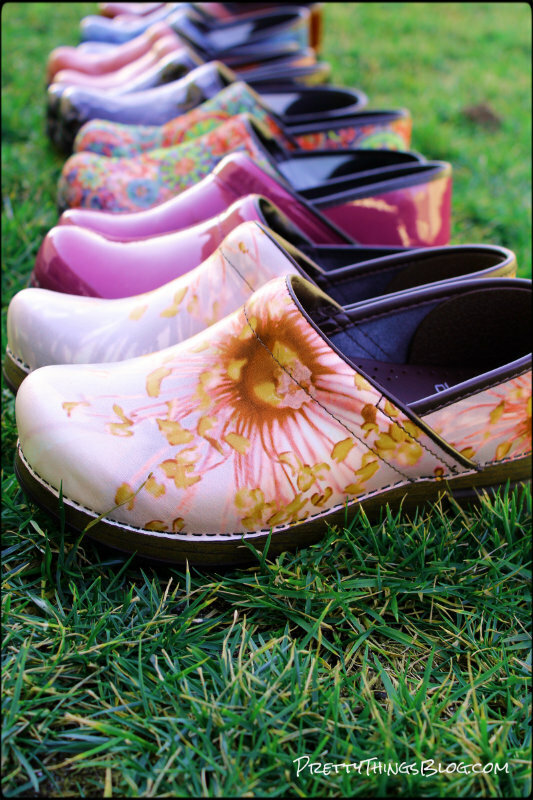 Your feet need to last, so dress for comfort. Trust me -- people are going to be too interested in the jewelry around your neck to pay any attention to what kind of shoes you're wearing. If that means you wear tennis shoes, by all means -- wear them. Happy feet are very important! 2) To save time at check-out, bring a sheet of adhesive labels. You've picked your beads, stood in line, and now you really want to move on to the next booth -- but you have to fill out information on the invoice. How to help the vendor? Print out address labels! Include your name, address, tax id, email, and phone number. I use the Avery 5160 labels, and all that info can fit with a 10-9pt font. 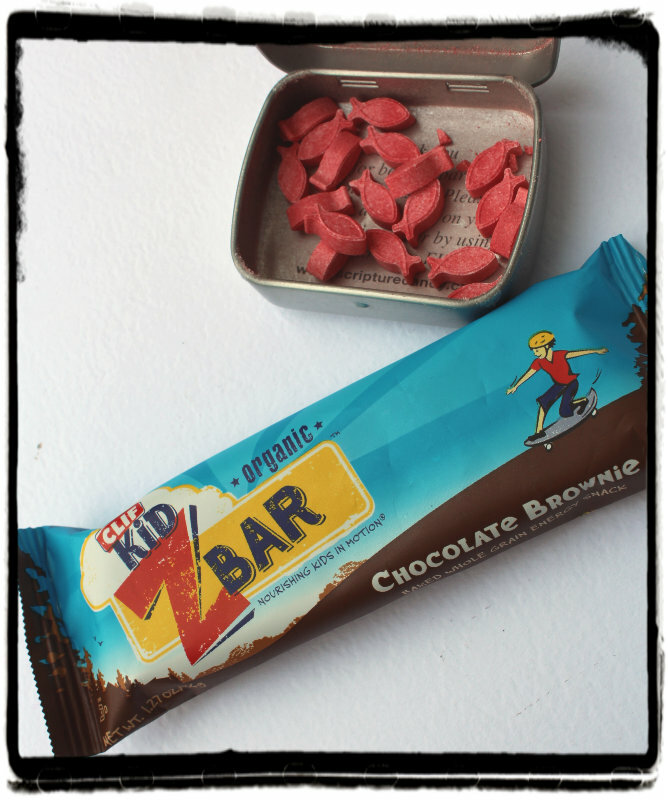 3) Take something to eat, drink, and freshen breath. Take a bottle of water (you can't stash a cup and straw quickly in your purse!) and a few portable snacks. As good as a banana might taste, after you get excited and load up your bag with what amounts to pretty, heavy rocks, you're going to end up with some gnarly banana pudding in your purse. And breath mints? Well, the mouth gets dry and yuck-o after talking excitedly with dozens of vendors! 'Nuff said. 4) Plot your course. 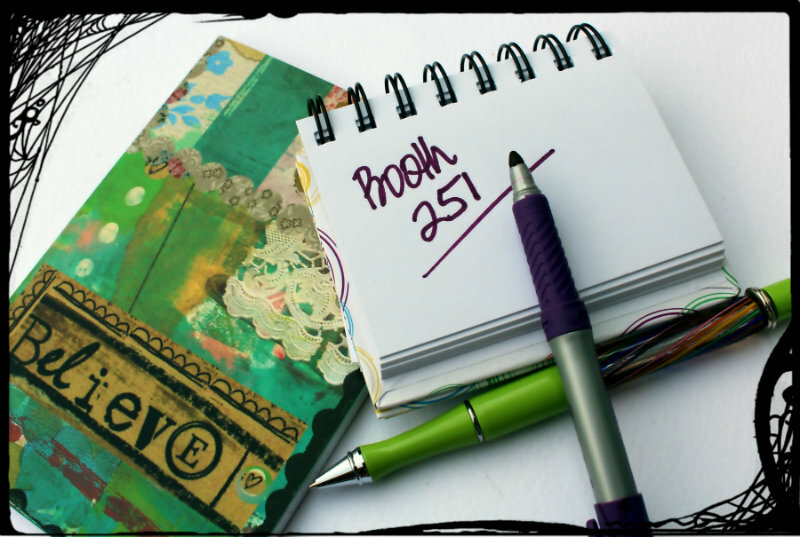 Bead and Button has a floor plan and a list of exhibitors, and you'll do yourself a favor by reviewing it before you hit the show. If there are vendors you absolutely MUST see, use a highlighter and mark their booth location and head there first. If you see something that's one of a kind, think hard before passing it by, as it may not be there when you get back. 5) Take a notebook and pen. If you're the type that looks at everything before you buy, it's a good idea to mark down booth numbers and what you wanted to buy there. You can also keep track of your budget, as it's really easy to lose count of how much you're spending if you use a credit card. 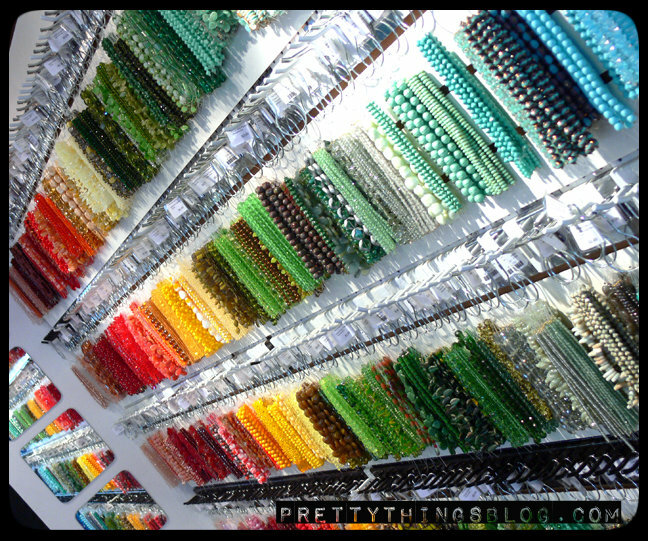 Additionally, some vendors don't mark the prices on all their strands, so you can quickly write down what costs what. 6) Carry a bag, but watch out! It's great to take a fabric shopping bag, but watch out when you have it full of beads slung over your shoulder. Turn too fast and you could knock over vendor displays. Don't pay attention, and people are whacking each other in the back, side, or head when they pass each other in the crowded aisles. Been there. Don't ask. You'll meet lots of people, and trading email, web site, and blog info is a great way to network. Vendors often like to see what you're making as Design Teams are becoming more and more popular. You just never know who you'll meet! 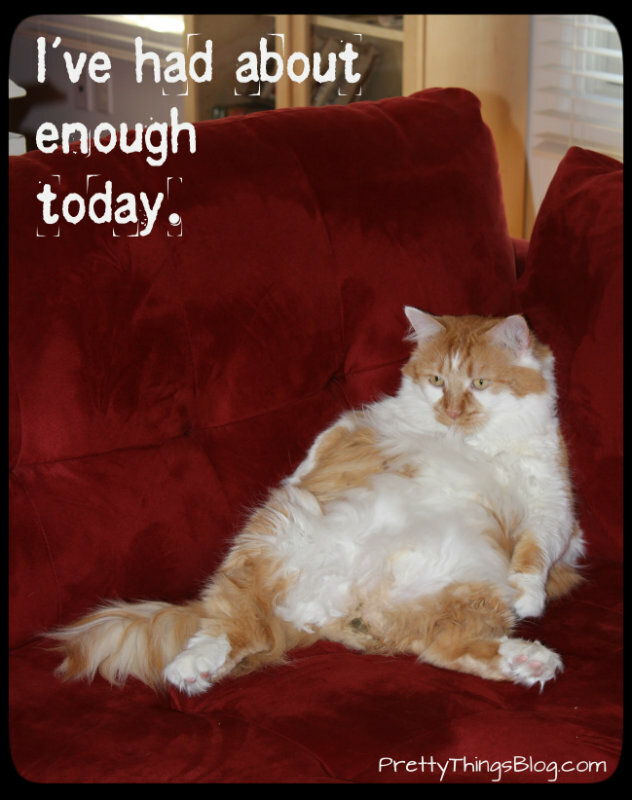 8) Periodically, take a break. People start making mistakes, either buying what they don't really need or passing over booths altogether when they're tired and hungry. Pace yourself! Don't end up like my cat. 9) Never ever pack tools in your carry-on -- coming OR going. I learned this the hard way. 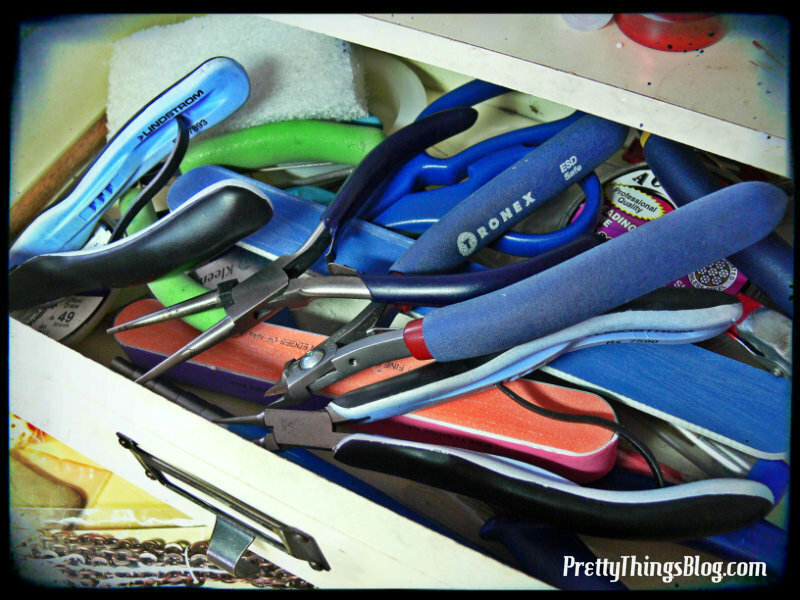 I bought a pair of crimpers and without a thought put them in my purse. I was halted at airport security because they decided I could take the plane apart. With crimpers. So my brand new, still in the package crimpers went .... in the trash. Consider packing a pre-stamped Flat Rate Priority Mail box and some stickers to hold it closed. You never know when you'll find something you HAVE to have but you don't think will pass the TSA stamp of approval. Also, pack an extra bag! Don't pack your suitcase to the gills, go to the show, and then have nowhere to pack your beads (or have to pay extra for an overweight bag). Again -- I learned this the hard way. 10) And lastly, wear something dazzling, and have fun! Quote of the Day: "PIE!" Book Review: "Joe Golem & the Drowning City"
Yesterday, I went to the International Gem and Jewelry Show. I haven't been in almost a year, and while I'm heading to the Bead and Button Show in Milwaukee in a couple of weeks, there are some vendors I frequent who don't go there and I had to stock up on a few things. 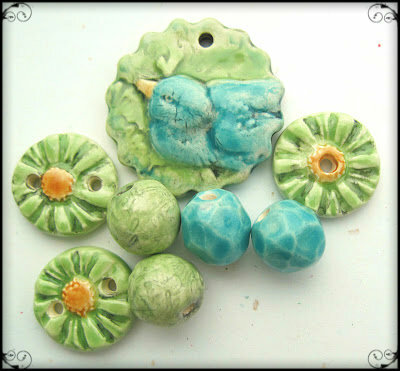 Some things I purchased were a slew of beauties for the upcoming Bead Soup Kit shop. I also got to say hello to a Facebook acquaintance while buying pearls. 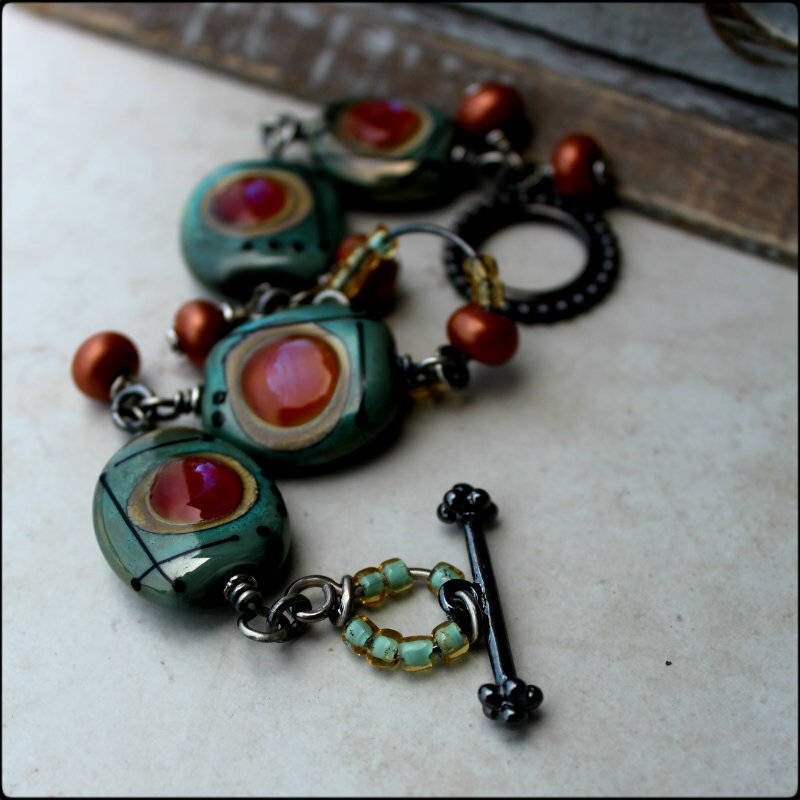 I found more of the amazing turquoise rondelles Cindy Wimmer had gifted me for my birthday. Basically, I was quite enjoying wandering the aisles looking at this and that. I used to exhibit at Intergem, but the smallest booth space is $1500, and that's a lot of stress to put yourself under. I'd met some people in the past years when I DID sell there, and I happened upon one woman I hadn't seen in a few years. "Oh yes! I think of you often!" People. I absolutely know I am overweight. However. In case you didn't think about it before, you never, EVER ask a person of ANY size when they're freaking due. Let's set the scene, shall we? I had dressed in this shirt from JJill.com. Obviously, I am not this thin. The shirt is a little flowy, which I like, because I don't particularly enjoy wearing a regular shirt that shows off my rolls. But it's not a pregnancy shirt. I also had on makeup (which I never wear), a KILLER necklace by Stephanie Sersich that should have kept everyone's eyes on IT. I had on Danskos that matched that shirt PERFECTLY. And I had on a smile, the best accessory you can have. Basically, I left the house feeling pretty darned good about my attire. 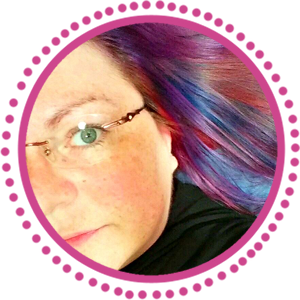 As many who read my blog know, I don't have much of a filter when I write, but I DO have one when I speak (for the most part) especially when I'm shocked by stupidity. I said gently, "No, I'm not pregnant. I've just gained some weight." Did she apologize? Did she stop there? Oh no, ladies and gentlemen. She then says, "Oh, well, frankly I didn't recognize you because you've gotten so heavy. Isn't it awful having to cart around that much extra weight?" Oh honey, no you didn't. Really????? This woman obviously does NOT have a filter. Or manners. I wished her a good show and went on my way. In fact, I was done shopping, so I left for the two-hour drive home, and had a good long think. First, let's get one thing straight. While it was humiliating, I was not sad, depressed, miserable, and did not feel sorry for myself. That is not what this post is supposed to evoke, and if you comment, I don't need to be told I look good, or I don't look that fat, or anything like that, because I have come to terms with who I am, I KNOW I am way too heavy, and I am doing what I can to make changes. BUT, if for whatever reason things DON'T change, that doesn't for a *minute* mean my INSIDES aren't the same. 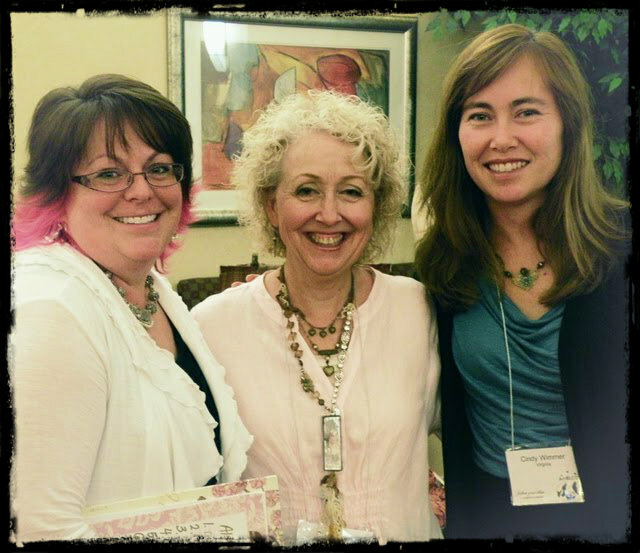 This is a photo of me, Diane Cook, and Cindy Wimmer last year. It's immediately obvious I am not anywhere close to thin, and I am 5'2" tall, to make the weight even more obvious. The photo in my profile picture to the above right is the result of no less than 91 photos taken by a professional. Ninety-one. Angles are everything. And I suspect she used PhotoShop. But it doesn't change my weight. Over the past 20+ years I've weighed 89 at my lightest (hello, anorexia) and 201 at my heaviest (not long ago). I have lost 10 pounds in the past month and a half, and while I don't see it in the mirror, I can wear a couple of pairs of pants I couldn't wear before. It's a step in the right direction, and while I do make choices to eat the wrong things at time (Mother's Day = pie) that is MY decision, and I know what I have to give up later in the week to compensate. I also haven't mentioned this in the past months, but I have been weaning myself off almost every single medication various doctors have thrown at me because, among other much more dangerous side effects, they are known for causing and keeping weight gain. THIS IS NOT TO SAY they are the only reason I'm Zaftig. I take full responsibility for not working out as much as I should, and for loving food, and that is a part of my weight issue just like the drugs and genetics are. However, in the past month and a half I've made drastic changes in diet and exercise and the detoxification of my body. I also was just told I'm pre-menopausal. This last drug is giving me the WORST withdrawal symptoms, and will take about two months to get rid of, but even when it's gone, that doesn't mean the weight will drop off. I realize that. I'm OK with that. You, my readers, don't need a daily blow-by-blow of that - booooring and sometimes TMI is just way too much TMI. Me and Sally Russick last year at ArtBliss. Here's my point, and the gem I hope people take home with them. You have no idea what a person's story is behind their weight, whether they're heavy OR whether they're very thin. You don't know if it's glandular. You don't know if it's from medication. You don't know if it's from genetics. You don't know if they were in an accident or have ailments that leave them bed-bound so they have no choice BUT to lead a sedentary life. And more important, you don't know how healthy they are. I know heavier people who have run marathons. This article gives some thoughtful evidence that you can be fit and fat (good lord how I hate both the word "fat" and "skinny".) I am no where NEAR pre-diabetic, have low blood pressure (almost too low at times, but not as I write this, ha! ), and my high cholesterol is hereditary. It was high when I was anorexic. It was high when I was a competitive athlete. Ditto for people who are very thin. I've had the misfortune of walking behind people at various points in my life and heard people not-so-quietly whisper, "YUCK! She's anorexic!" or worse yet, "OH, she HAS to be a meth addict to be that thin. Gross." It's politeness alone that didn't cause me to smack them upside the head. NO ONE knows a person's story unless they choose to tell it to you. Some people are highly prejudiced to overweight people. I've unfortunately known and severed ties with some of these sorts of people. Six years ago a "friend" would text "MOOOOO!" at me -- yes, I'm a cow, is that all you've got? Bring it on, I've heard it all, and it doesn't change my personality. I would like to think I'm loyal and caring and empathetic. I know I'm impatient. But I also know I'm giving. There is a lot to know inside this body. 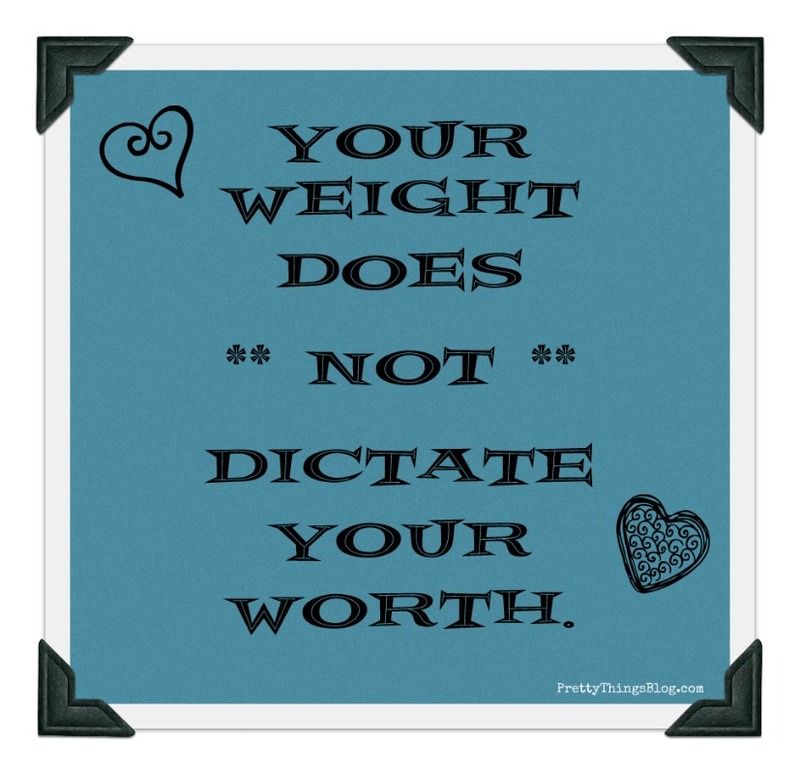 Weight should not enter into how a person feels about themselves (as easy as it is to do -- and I have been guilty of that). Your character matters. Not every thin person stays thin. Not every overweight person stays that way, either. If you are rude enough to make an insensitive comment about someone's weight -- well. What does that say about you? What happens if, heaven forbid, weight becomes an issue for YOU? Make changes if they make sense to YOU. Don't let anyone make you feel lesser. 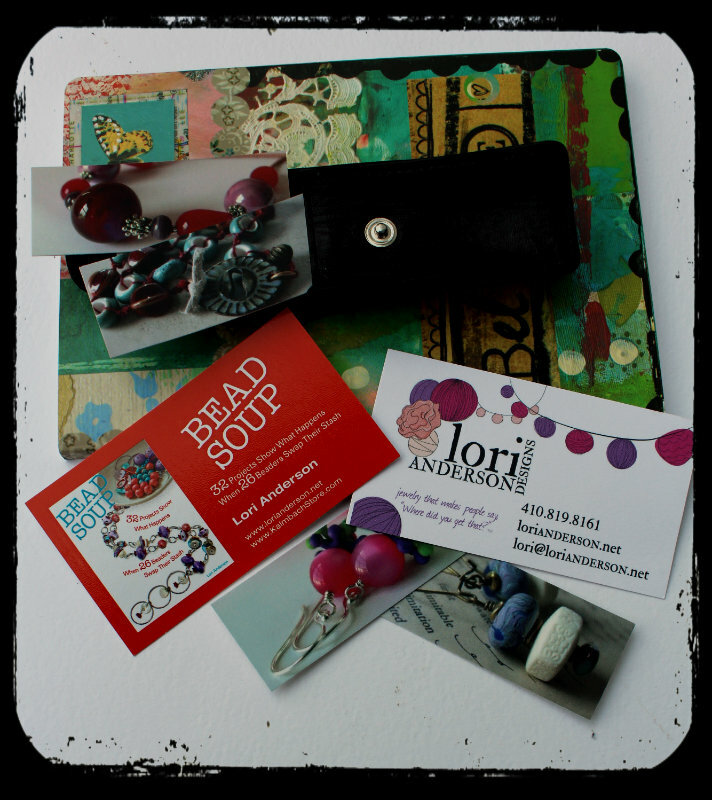 Welcome to the Cup of Bead Soup Reveal! 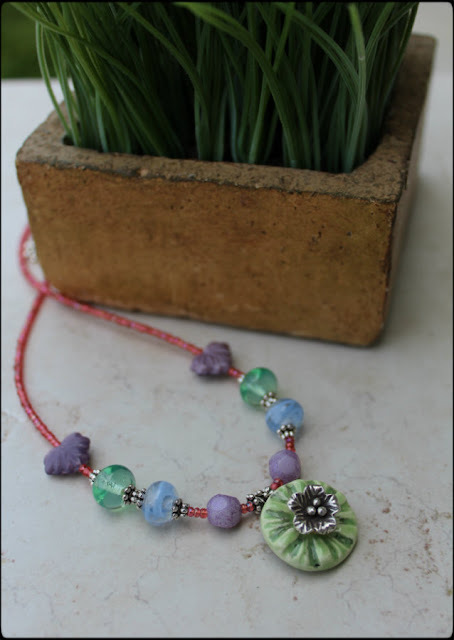 If you've been a follower of my blog, you're already familiar with my Cup of Bead Soup project. 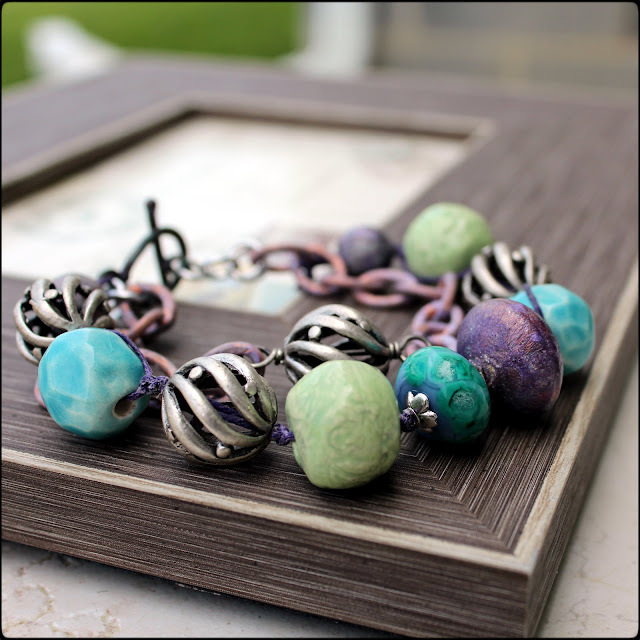 In 2011, I purchased beads, sight unseen, from various bead makers and tasked myself with creating things with components I didn't choose myself. It's been a fantastic way to push my design skills and break out of making the same old/same old. 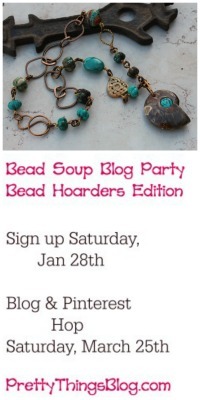 In essence, it's a one-woman-production of the Bead Soup Blog Party (and sign ups for THAT are coming so SOON!) Anyway, I changed the process for 2012 to include three additional designers, the same set of beads, and made it a mini-hop. Each Cup of Bead Soup, you'll have the chance to sign up to participate and be chosen randomly. I started with the bird pendant. 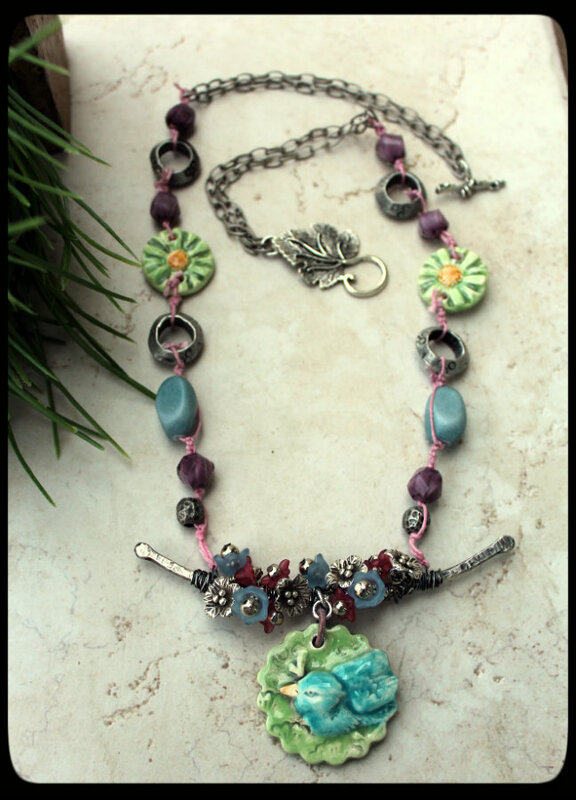 I wanted to make something spring-like, and thought of tree blossoms on the branch. I followed the color of the pendant with the green and the yellow matching links and the blue in the Czech glass and lucite flowers. 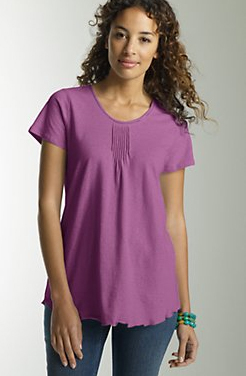 To stay spring-like, I added purple, pink cording, and to top it off, a leaf toggle clasp. To make the pendant piece, I took a 10-gauge piece of sterling silver and hammered it as flat as a I could into a slight curve. I touched the ends of the silver to the torch to round them out a bit, as cutting this heavy a gauge of wire usually leaves some rough ends. Next, I took 24-gauge wire and lashed a profusion of flower charms to the branch. On either end, I made sure to leave one loop slightly above the surface so I could connect the pendant to the rest of the necklace. The flowers are a mix of Thai silver and vintage lucite. I used one purple patinaed link from a chain by Miss Fickle Media to attach the bird pendant. I just liked transferring the pastel colors instead of adding a silver jump ring, and it's all about the details for me. 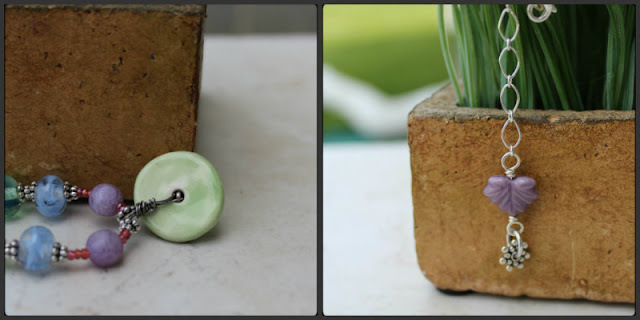 Once again I challenged myself by using waxed linen instead of wire linkages or beading wire. I'm starting to feel a lot more comfortable with it! 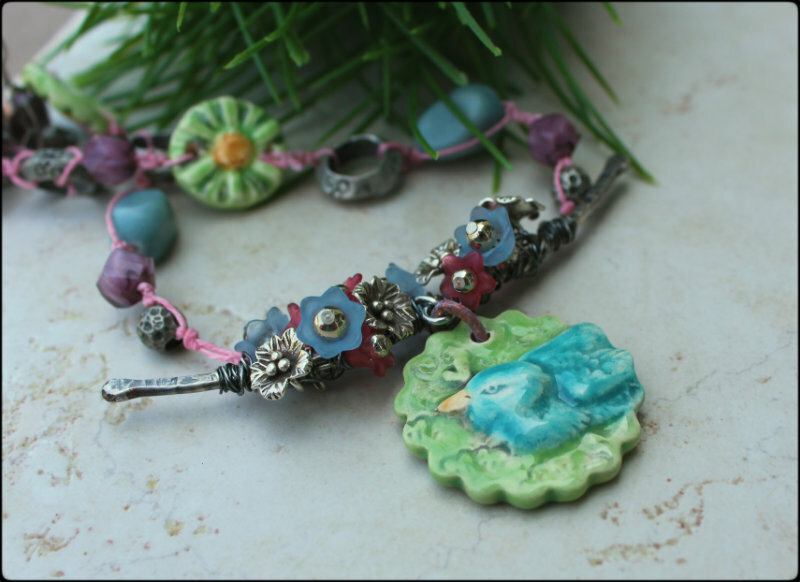 My next piece is much more delicate, and uses Nan's disk with the hole in the middle, a few of my lampwork beads, Czech glass, and seed beads. 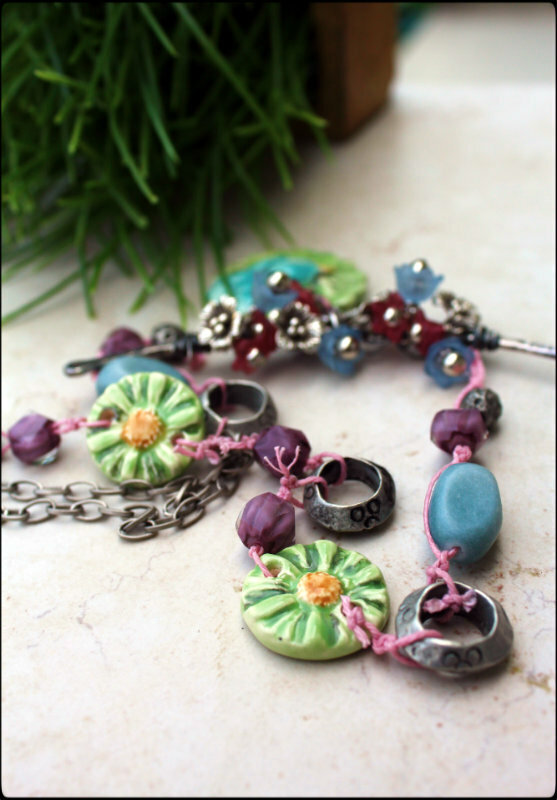 I took one of the leftover Thai silver flowers and gently mashed the round loop to a narrow rectangle. I then threaded a piece of wire through the rectangle and the hole in the disk, bent it upwards, and make a bail. Again, details -- a pretty dangle on the end of the extender chain. I like doing this because it also adds a small amount of weight as a bit of a counter-balance to the necklace. 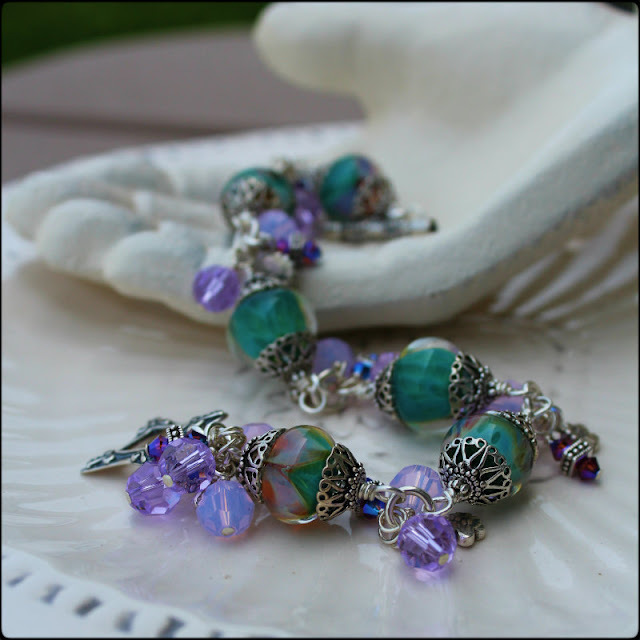 Next, I used Nan's organic faceted ceramic beads in blue and green, one of my lampwork beads, and a few purple patina beads from Miss Fickle Media. 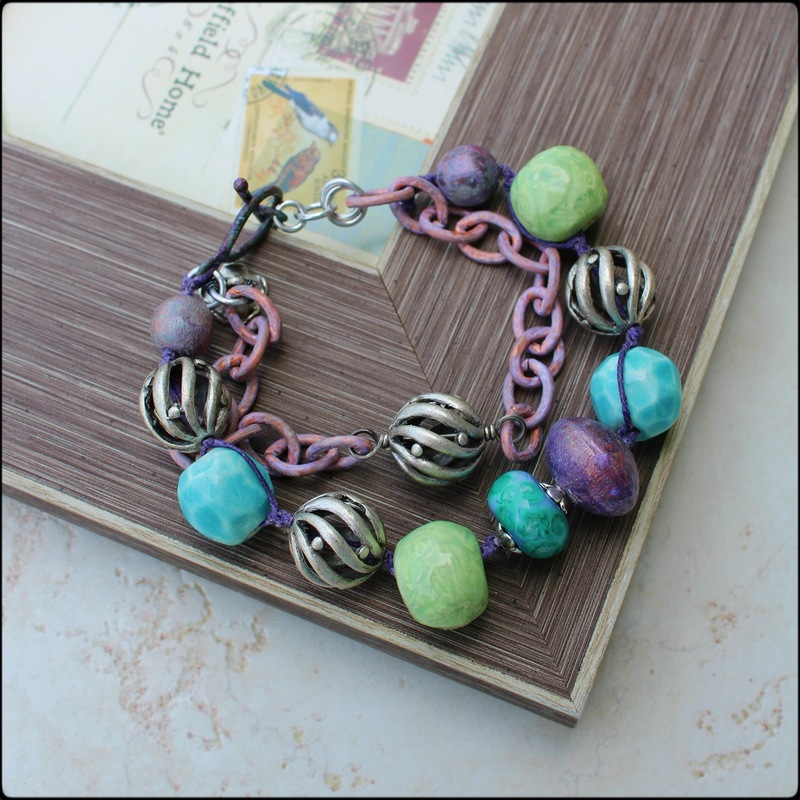 This is a double-stranded bracelet, incorporating the remaining purple chain I'd taken a link from for the first necklace and a matching purple toggle clasp. Once again I went for the waxed linen, this time in purple. Fiber and cording works wonders on large-hole beads! The silver beads are a recent find from AD/Adornments. Lastly, Nan gave us all a surprise -- a Cup of Soup pendant! 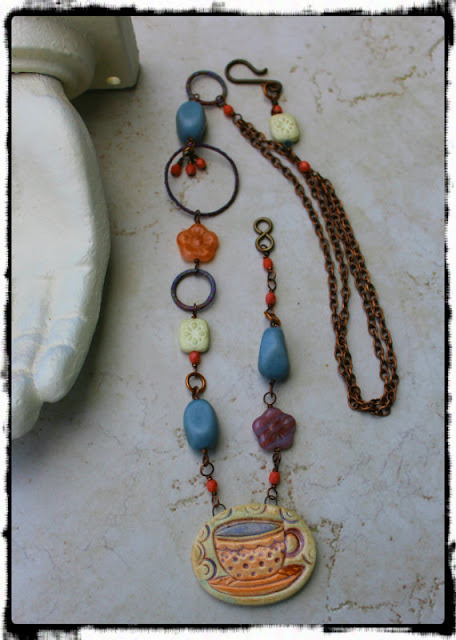 This one I worked up in copper, blue Czech glass from the first necklace, the last of my Miss Fickle Media purple rings, a bit of peach and ivory to balance the pendant's colors, and some touches of coral pink. A double strand of copper and a hook clasp that closes on the side of the necklace complete the look..
but put their own style into them! 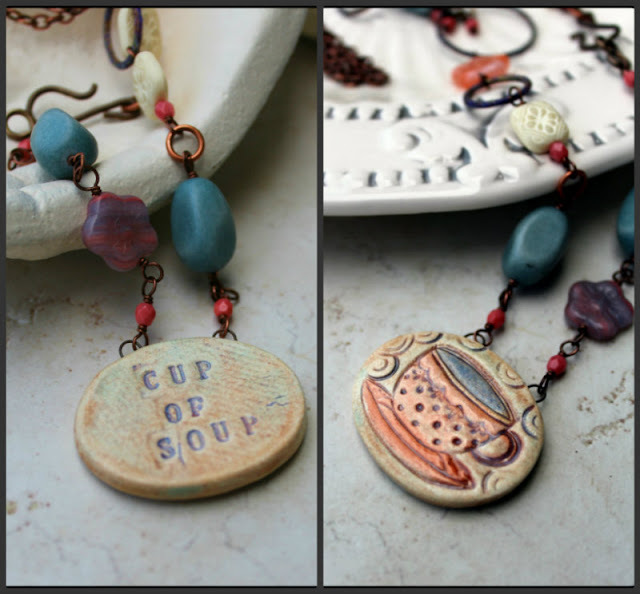 for limited edition Cup of Bead Soup sets! 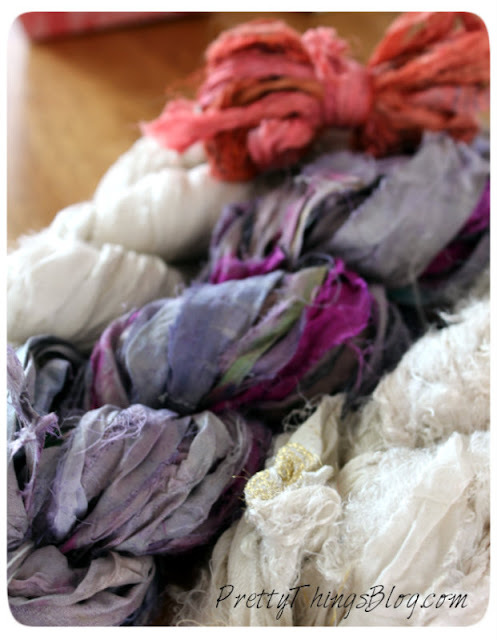 Sari silk waiting to be put into Bead Soup Kits for the upcoming store. 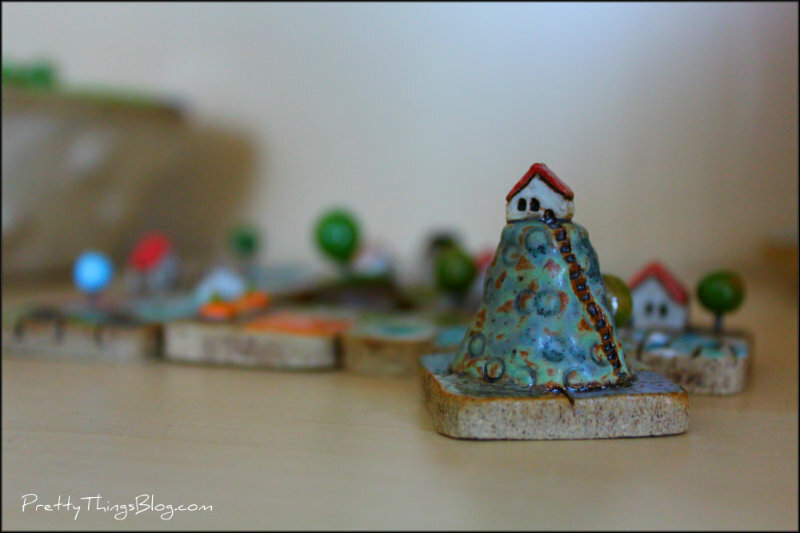 A tiny house on a hill by Elukka. I love collecting her "My World" pieces. 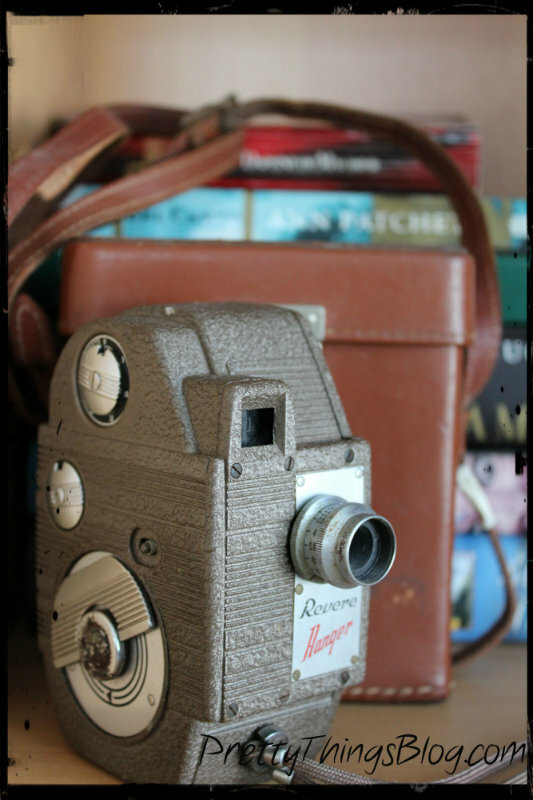 a Revere Hanger video camera. with beads by Nan Emmett. how different do you think we'll be? One Crayon Color Challenge Reveal! Could this be better than pie?